A wedding is as individual as the two people who are committing themselves to each other. At Bevington’s Catering we know that this is your day and we will make sure that the food complements this. From a simple finger buffet to a full sit-down meal, we can provide a package tailored to your requirements, produced with the style you have in mind. 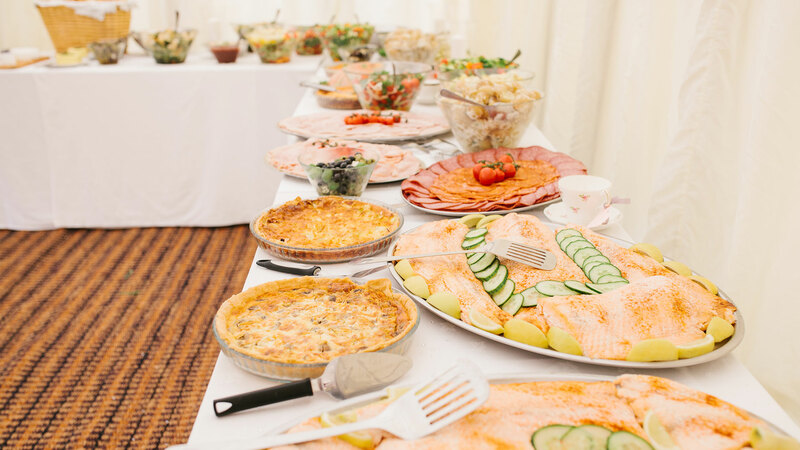 We can do traditional or more individually-styled packages, and we will always take time to sit down and make sure we together work out the perfect wedding catering package for you and the people you care about who will share in your day. We can arrange all crockery, cutlery and cloth hire and anything else you might need to ensure your day runs smoothly. Prices include the provision and setting up of food and all staff necessary in order to ensure the party runs smoothly. Friendly, polite and attentive staff will be waiting on, and we will leave the venue in pristine condition at the end of the day. Please get in touch at any time and I would be delighted to come and see you and to start planning your wedding catering. As with everything we do at Bevington’s Catering we source locally wherever possible, supporting local farmers and suppliers. We are fully certificated to meet all legal requirements, and will provide you with detailed information about allergens and will adapt our recipes accordingly if this is likely to lead to any problems for you or any of your guests. The menus on the Sample Menus page are guidelines and any of these menus can be adapted, as well as adding any of your own thoughts. I am always welcome to new ideas and recipes.